Range: Komodo National Park, the Lesser Sunda Islands, Indonesia. Habitat are typically dry arid savannah, and low level rainforest. Diet: Water buffalo, pigs and deer. The Komodo dragon is the largest living species of lizard. It is a close relative of the smaller monitor lizards found from Australia throughout Indonesia, Asia and across Africa. However, the Komodo dragons range is restricted to a small island chain in the Lesser Sunda Islands of Indonesia, mainly Flores and some adjacent islands such as Komodo and Rinca. The fossil record, and molecular sequence data, indicate that Komodo dragons have their origins in Australia. When sea levels were low during the Pleistocene, Komodo dragons dispersed westward from Australia to the Lesser Sunda Islands as far as Java. Another giant Varanid lizard, currently unnamed, also dispersed as far west as Timor, but became extinct along with another Australian giant, Varanus prisca, which appears to have remained in Australia. 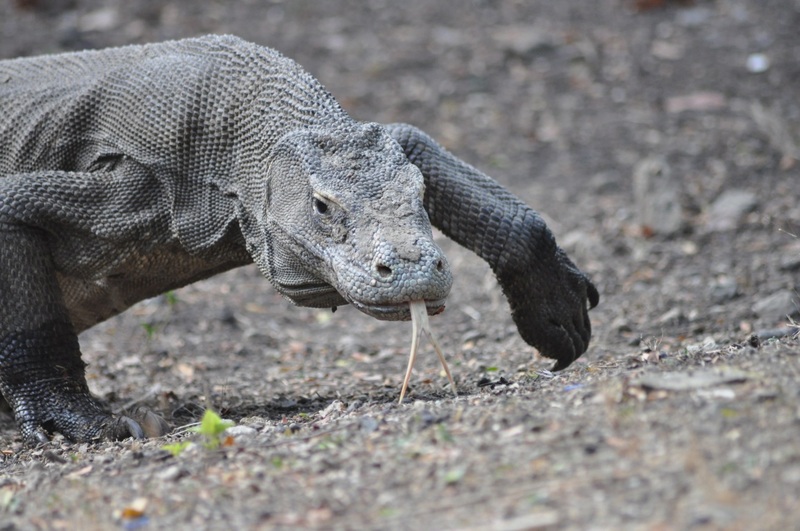 After the climate warmed and sea levels rose, Komodo dragons became isolated and survived to the present day by adapting to the changing environments including the arrival of humans and change in natural food sources such as the extinction of indigenous species and introduction of novel species. All three giant Varanids became extinct in Australia and the small populations of Komodo dragons in the Lesser Sunda Islands are the only remaining lineages. Komodo dragons are famous for their drooling saliva, rich in bacteria, which was suspected for many years as the causative agent for immobilizing prey. However, in recent years this hypothesis has been tested and new evidence suggests that the dragons actually possess a venom gland that secretes an anti-coagulant venom. However, this does not mean that the dragons do not rely on bacteria to immobilize prey. While sheer size and their overpowering strength enables the dragons to take down sizable prey, and anti-coagulating venom works well to take down medium sized prey such as pigs and deer, prey such as water buffalo are exceptionally large, and require a different approach. When an opportunity presents itself, a dragon will bite an unsuspecting buffalo leaving it with a small open wound. However, it is not necessarily the toxic saliva that causes the prey to die. Its natural instinct is to bathe the wound but on these tropical islands there is no permanent fresh water source and the only water bodies available to submerge in are stagnant pools rich in potentially pathogenic microorganisms. As time passes, the animal weakens and after a week or two it is overwhelmed from septicaemia and this is when the dragons move in and finish the attack. Komodo dragons are known to give birth via parthenogenesis, a type of asexual reproduction whereby a female can give birth to a litter of dragons without the presence of a male. In recent years, this phenomenon has been recorded in other Varanid lizards and also in snakes. This is a useful trait that could allow a single female to recolonize an island after a natural disaster or a new island and maintain a colony of females until a male from a neighbouring island arrives and facilitate gene flow via sexual reproduction.